Sloan has a new EP on the way, and they're offering up the title track, "Take It Upon Yourself", as a free download. The only catch is that you need to join their mailing list (the link for the download is emailed to you). The track is a pretty good Chris Murphy rocker, by the way. This California band has a couple of quality discs under their belt, and now they're back with a brand new EP titled All Here Now. And for a limited time, you can get it for free from their official site. They have a mod-60s sound, with a bit of soul thrown in, and your toes will be tappin' while you give them a listen. If you want the physical EP, a CD Baby link is below. About five months ago, we featured this Ohio band's 2009 reissue of their 2007 debut This is Not Here, and now they're back with the followup, Geronimo. And while the debut was solid, Geronimo is a great leap forward in terms of songcraft and execution. For those who didn't click on the link above, First In Space has a Gin Blossoms/80s REM hybrid sound, and to that they've added a bit of fellow Midwesterners The Replacements to the mix, especially on the cheerfully-titled opening duo "Goddamn Shame" and "It's All Gone to Hell". "Take it Away", and even moreso "They Won't Catch Me Now" channel the Blossoms, and "Stuck Around You" would make Tom Petty proud. Elsewhere "Down on Me" and "End of the Night" are fabulous midtempo power pop, and the manic "Taking Over" gives them a chance to show their guitar-playing chops. It's a much more consistent and melodic effort this time around (not that the debut wasn't good), and if you like your power pop Midwestern-flavored, look no further. Here's a long-lost video for Brothers in Stereo's "The Worst Crowd" a great tune from their fine self-titled disc from 2003. For those new to this blog, BiS consists of Andrew & Chris LeDrew, Canadian brothers who also each released mid-decade solo discs reviewed on this site (Andrew's Ladies Lookout will probably find a way into my top 20 of the 2000s). These guys could be the Canadian equivalent of Oasis (Andrew - who sings lead here - kind of looks like a Gallagher), except that they don't snort a lot of coke and endlessly fight with each other (at least not that I'm aware of). Anyway, here's hoping one or both or both together decide to release some new material. LeDrew update: I just noticed that both of Chris's solo discs are available on Amie Street for the current combined price of $4.31. 1997's Too Commercial is out-of-print and pretty hard to find (I recall snagging a copy off eBay a few years back), and 2006's Stronger Man is quite good too albeit a bit less jangly. Andrew's Ladies Lookout is there for $3.27, a bargain as well. If George Martin, Billy Preston, Murray the K et al. have been known as the "Fifth Beatle", then Jeff Larson could be called the Third American, as in America the band. Larson has closely worked with America's Gerry Beckley and Dewey Bunnell over the years, but he takes it to a new level here with Heart of the Valley, which features eight original tunes penned by Beckley, two co-written with Beckley, and one Larson original. Beckley also produced, engineered and recorded the album. Last year I wrote when reviewing Larson's last disc that "we all know the cliche about death and taxes being the only certainties, but there's another one to add to the list: about once a year, Jeff Larson will release a quality disc of laid-back California pop in the vein of America, Dan Fogelberg and The Eagles and make it sound effortless." With Beckley's help, he's done it again. The title track sets the template for the disc: an easygoing melody, fine singing from Larson and backing vocals from Beckley. "Sudden Soldier" is more in the vein of upbeat America, a la "You Can Do Magic", and "Minus Marci" (a Larson co-write) might be the album's best track with its irresistible chorus, fine Larson-Beckley harmonizing and some quality guitar work. Elsewhere, "Calling" is a great rainy day ballad, "Five Mile Road" sounds as well-worn and rustic as its title, and Bunnell himself sings backup on "Southern Girl", making the America connection complete. Let's face it: a Jeff Larson disc is a no-risk proposition. If you enjoyed his previous releases and/or a fan of America and/or a fan of the laid-back 70s California sound, you've got your album of the year. The sideman gone solo power popper has become a bit of a cliche on this site (a good cliche, mind you), and the latest entrant into the field is Reno Bo. He's been a guitarist in both The Mooney Suzuki and Albert Hammond Jr's backing band, and now he's unleashed a gem of a disc that successfully melds classic rock and power pop. The proceedings begin with "There's a Light", a classic anthemic number that finds the midpoint between Oasis and The Black Crowes, complete with majestic guitar solos building to a crescendo. "Higher Tonight" is straight-up power pop in the vein of Cheap Trick or a better Tinted Windows, the moody "Off Your Back" has a Tom Petty-in-pop-mode feel, and I can almost see the lighters being waved in the crowd during the big buildup of "Shine". Elsewhere, Bo knows folky ballads as well - "Baby, You're Not Feelin' Me Tonight" provides a nice change of pace, while "Sugar Suite Blues" isn't exactly the blues but instead the hardest-rocking track on the disc. "How Does It Feel" rocks with swagger, and the breezily melodic "Here Right Now" is almost jangly. "I See Stars" closes out things in fine fashion, a midtempo pop nugget that once again features fine guitar work from Mr. Bo. If you like your power pop with more of a rock edge to it, you should know Bo. New single from The Singles. These classic power-garage-poppers are back with 2 fine new tracks. Listen below, or if you're in a non-Lala-authorized place, listen to them on their myspace. Dover's "Local Girls" opens the disc, and although the tune shares its name with a famous Graham Parker tune, the sound here is reminiscent of Skynyrd's "What's Your Name?" crossed with a chorus that recalls lines from "Wig Wam Bam". It's an audacious combination that needs to be heard. Among his other tracks, "So Far" channels Pleased to Meet Me-era Replacements, "Feel Young" and "Alright Uptight" are racuous rockers, and "Iron in the Fire" is high-energy fun. As one might expect from a guitarist, his songs are heavy on the solos. Gibson's songs lean more to the pure power pop side, especially "Get it Out (Kimmy)" and "By the Sea". "Funky Junk" brings the Red Hot Chili Peppers to mind, and his "Melody Rain" starts off in power ballad territory (really, it's a great title for a power ballad), and turns into a bit of a riff-fest. Cover chips in with "Just Wait", which adds a bit of rhythm to the mix, as well as the punky "Roll With It". It's a mix of rock and power pop styles, but the common denominator is quality musicianship without any dud tracks involved. These guys have just turned 20 on average, and they have a bright future ahead of them. David Grahame has a new untitled album out, and Bruce at Not Lame has the limited 75-copy run. Aside from the limited quantities, there's a catch: It's priced at $11.50 per track. And there are only two tracks. Sounds enticing, right? Actually the two tracks are two long song medleys that total 55 minutes, so it is the length of a full album. Apparently, Grahame is taking a page out of Lannie Flowers' (and Paul Westerberg's) book. This kind of thing isn't my cup of tea as I'm an iPod guy, and I'm not into 20+ minute tracks (I'm a huge Westerberg fan for example, and I have his 44:00 mp3, but I've never listened to the whole thing through once). But if you're a Grahame fan with $23 to burn and a long attention span, act now while Bruce still has them in stock. About three months ago, I touted the release of this disc from one of power pop's leading lights, but realized I never gave it a proper review. It's an oversight that needs to be corrected because it's one of 2009's better releases. 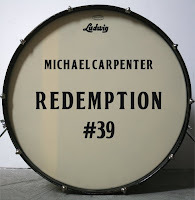 While Michael Carpenter discs have always been melodic delights, and he's always been a strong lyricist, here he takes his game up a notch with songs that have both melody and meaning. Therefore, it's fitting that the opener here is "Can't Go Back", a clear-eyed look at both a relationship and one's life to date complete with Carpenter's patented pop goodness and Beach Boy/Beatles-styled backing vocals. The title track follows, with the title itself and Carpenter's lyrics and vocals getting as close to Dylanesque as he's ever attempted but without sacrificing his sound. Carpenter then offers up his solo take on "Workin' for a Livin", a track he first released with the Cuban Heels on one of their 2008 EPs. The song sounds like a country classic that's been around for years, tackling the familiar theme of (un)employment. "I'm Not Done With You" is a gentle midtempo number that finds Carpenter at his tuneful best and features a lovely guitar solo. Unlike many other artists in the genre, Carpenter is plugged into the power pop scene (see his SOOP #2, a cover album of contemporary power poppers like The Shazam, David Grahame and the Myracle Brah), and he pays Queen, Jellyfish and all of their power pop acolytes homage on "The King of the Scene", a tune that deserves to be the first single off the album if such a thing really existed these days. There's plenty else to dig here as well, from the lilting "Don't Let Me Down Again", the pure power pop harmonies of the "Middle of Nowhere" (which with its introspective lyrics and classic Carpenter sound, could serve as the soundtrack of his life), the textbook power pop of "I Want Everything" and the languid but affirming "Falling Down". As anyone who follows my Twitter feed knows, I'm a big baseball fan. And the analogy that can't help but come to mind for Michael Carpenter is Albert Pujols. Both are so good and so consistent at what they do, we tend to take them for granted. If this were a debut album by a heretofore unknown artist, I'd probably give it a siren and be touting it from here and every other bit of social media I could get my hands on. Instead, I kind of left it on the back burner of this site, perhaps subconsciously thinking that everyone who reads this blog already has this disc or has otherwise heard it. But then I stopped to listen to it again, and I realized that it doesn't matter if he's put out about a half-dozen excellent records before. Each one is its own discovery, and it's not a stretch to say that this is his best yet. Fate Lions-Good Enough for You. Fate Lions are a Dallas-area band that makes low-key, but interesting and melodic pop. So it wouldn't be a shock if you found out that they were produced by Salim Nourallah, the master of low-key-but-interesting-and-melodic-pop himself. Fate Lions are a bit more upbeat and rocking than Nourallah, but they do share his sensibility and style, meaning that these songs may not jump out at you from your CD or mp3 player, but after a few listens they have a sneaky way of insinuating their way into your head. There's plenty to like here - the Teenage Fanclub jangle of "Seen it All" and "Calendar Girls", the catchy Americana of "Starsign", which recalls Additional Moog and Romantica, the Lemonheadesque "The Girls Are Alright", and the Midwestern rock of "Ride the Artifact". Check it out - it's more than good enough for you. The Luxury-In The Wake of What Won't Change. This Boston band has an affinity for long-ish album titles (their 2007 debut was This is Why We Can't Have Nice Things) and the big sound of bands like Jet and Oasis. They've opened for Coldplay, and their sound is even broader than the bands mentioned in the last sentence. The standouts here are "Nothing Comes to Mind", which nails the Britpop sound (you'll be looking for a Gallagher in the songwriting credits), the jaunty "Straitjacket", which proves their sound isn't limited by one and has a Fratellis-like vibe, and the American modern rock sounds of "Take it Back". This is one Luxury you can afford.